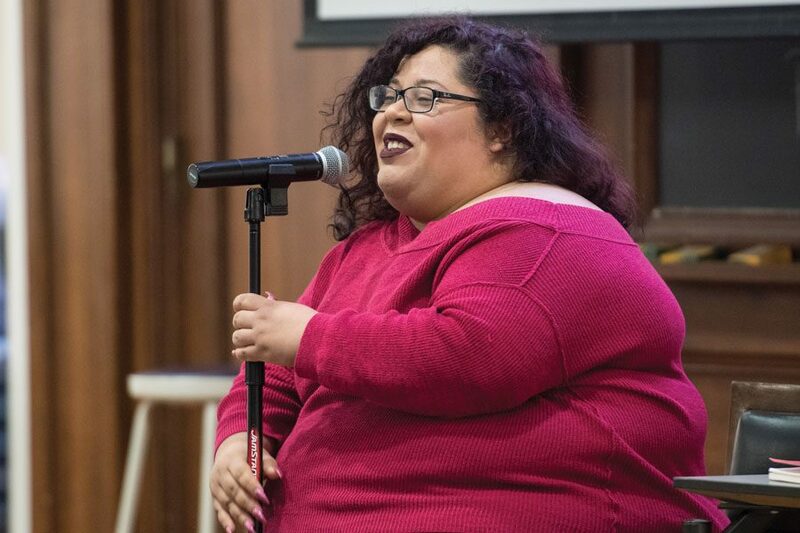 When Los Angeles-born Salvadoran poet Yesika Salgado spoke and performed her work at Northwestern on Thursday, she said she was happy to see her fans from across Chicago gathering in Harris Hall. While it is important to speak at institutions like NU, Salgado said it is also important for her art to be accessible. “I come into these spaces, but I’m just your homegirl,” she said. Salgado’s supporters from across the state gathered to listen to the poet speak about love, identity and community. The event was co-sponsored by MEChA de Northwestern, the Beta Psi chapter of Lambda Theta Alpha Latin Sorority and the Latina and Latino Studies Program. The poet shared several pieces from each of the five chapters in “Corazón” while explaining her creative process in piecing the book together over the span of two weeks. Salgado said the motif of a mango is embedded throughout her book as the basis of her organizational strategy. The chapters are named after stages in the growth, ripening and eventual rotting of a fruit, Salgado said. Salgado is an internationally recognized body positivity activist, and said that she often explores her identity as a self-proclaimed “fat woman” in her poems. She said being a “fat woman” plays a role in the way she loves because people assume that fat women are “not human” and don’t deserve to have standards in romantic relationships. Salgado opened up to the crowd on her tumultuous relationship with her father, who struggled with drug addiction. Pomona College graduate Brenda Benitez asked Salgado how she has been able to finally be comfortable with her true self in front of her father. Although Salgado said her father passed away before she became a successful poet, she encouraged Benitez to focus on forming healthy relationships with other people who do love her for who she is. Benitez told The Daily that the poet’s work resonated with her because, like Salgado, she struggles with becoming comfortable with some parts of her identity. While Salgado found comfort through poetry, Benitez said she also tried to find peace through writing, like through a college course that encouraged writing as a form of healing. Medill senior and MEChA member Marvin Sanchez, who helped organize the event, said he was happy to see audience members coming from outside of NU to engage with Salgado’s poetry. He said it has always been a “dream” to host the poet. “We don’t do enough to shine light on Central Americans in the diaspora,” Sanchez said. This article has been updated to clarify an audience member’s question.